“Remember His Name” “Vitalii Sediuk” He’s gonna live…………..
25 year old Vitalii Sediuk loves American celebrities. He’s been slapped by Will Smith. His face has been under America Ferrera’s dress and in the crotches of Bradley Cooper AND Leonardo DiCaprio. Encounters with other A- listers has made him celebrity enemy number one. Vitalii Sediuk was a reporter for the Ukrainian television channel 1+1 . He was fired from his reporter job after he jumped under actress America Ferrera’s dress on May 17th at the Cannes Film Festival. Even though he is a known prankster, the TV network says they were not involved in his stunts. He kissed Will Smith at the premier of Men in Black III in Moscow. Smith not feeling particularly romantic slapped the crap out him and asked ” What the HELL is your problem? He eluded security to get a second-row seat inside the Staples Center at the 2013 Grammy Awards, despite having no credentials. 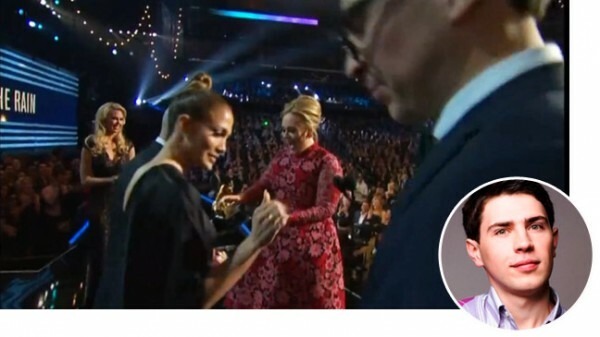 Sediuk jumped onto the stage when Jennifer Lopez announced Adele as the winner. “I love you, Adele,” he is heard saying as the singer approached. He was arrested offstage and later prosecuted on two misdemeanor charges. Sediuk attempted to enter the 85th Academy Awards wearing drag. But was turned back by security . I think there is something on your crotch…..My Face!!!!!! Bradley Cooper at the 20th Screen Actors Guild Awards at the Shrine Auditorium in Los Angeles. Sediuk gave it his all and bared it for the fashionistas during New York Fashion Week . Where he was arrested for trespassing. As she posed for pictures the premier of How to Train Your Dragon 2 at the Cannes Film Festival Sediuk crawled under her gown. While his wife Angelina Jolie ,star of Maleficent was being interviewed on one side of El Capitan Theater on Hollywood Boulevard Wednesday. Brad Pitt was on the other side signing autographs. Sediuk allegedly jumped the rope and hit actor in his face, according to Los Angeles Police Sgt. Leonard Calderon. Pitt, who looked as he got a couple of punches in, continued unfazed on the carpet to giving interviews. Sediuk was held in the Los Angeles County Men’s Central Jail after failing to post $20,000 bail, and was indicted on May 30, 2014 on charges of assault and battery. 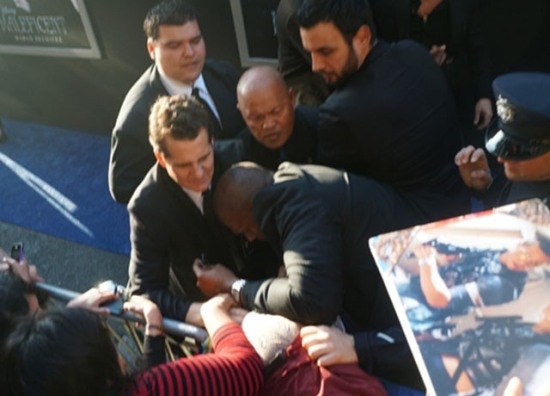 Sediuk was also charged with unlawful activity at a sporting or theatrical event or exhibition, and unlawful delay of a unlawful activity at a sporting or theatrical event or exhibition, relating to his 2013 Oscars stunt, prosecution for which had been deferred at the time of the incident on condition of his good behavior for three years. Sediuk, 25, previously told “The Hollywood Reporter” that he relied on 1+1 — a celebrity-oriented network that airs the Ukrainian version of The Voice to cover the legal costs incurred during his last brush with the law, following his arrest for storming the stage at the 2013 Grammys. That incident resulted in three years of probation and a lifetime ban from the L.A Live complex. This time around, Sediuk — who is still being held by the L.A. County Sheriff’s Department on suspicion of battery, pending $20,000 bond — will be left entirely to his own devices. His first appearance before a Los Angeles judge is scheduled for Today, but he has already been slapped with an emergency protective order barring him from approaching Pitt. The restraining order expires on Monday, but is likely to be extended. This entry was posted in Celebrity Drama, Entertainment, Film/Cinema, Music Industry, NATIONAL, Rumorcity, Scandal, Ukraine and tagged Adele, America Ferrera, Bradley Cooper, Cannes Film Festival, channel 1+1, Jeniffer Lopez, Leonardo DiCaprio, Madonna, Vitalii Sediuk, Will Smith. Bookmark the permalink.